Red Bike Girl, originally uploaded by glueslabs. One bill likely to see action in the state legislature this year is HB 1217, which would allow municipalities to bypass red tape when lowering speed limits on non-arterial streets (such as residential streets). Today, all residential streets in Seattle have speed limits of 25 miles per hour unless a sign designates otherwise. A person struck by a car going 30 miles per hour has a 40 percent chance of dying. When the speed drops to 20 mph, the chance of dying drops to 5 percent. And, of course, collisions are less likely to happen in the first place at slower speeds. Last year, freshman representative Cindy Ryu of Shoreline was the main sponsor of the bill. The bill has bipartisan support and passed the House unanimously 92-0 before dying in the Senate Transportation Committee. 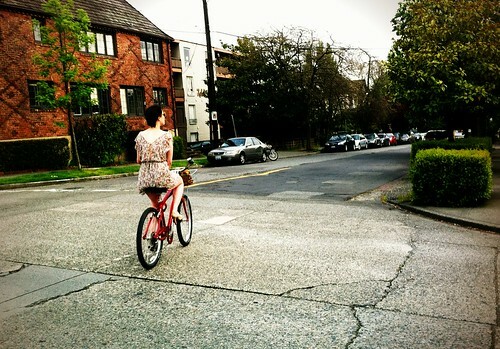 See the postmortem I wrote for Seattle Bike Blog earlier this year. The bill has come up in the news recently after Mayor Mike McGinn voiced his support for the bill ahead of the city’s Road Safety Summit, scheduled for October 24 in the Bertha Knight Landes Room at City Hall. A time has not yet been announced. You are invited to participate in a public meeting regarding traffic safety on 12th Avenue and 12th Avenue East on Wed., Oct. 26, at 6pm at the Capitol Hill Branch of the Seattle Public Library (425 Harvard Ave. E.) We at the Capitol Hill Community Council have been working in coordination with the Seattle Department of Neighborhoods and Department of Transportation on a Neighborhood Matching Fund project focused on making traveling along 12th safer for all: pedestrians, bicyclists, and motorists. We recently hired SvR Design to serve as our transportation consultant, and in the months ahead, we will together be preparing a list of recommendations on how to make this street safer. It is vital that members of our community participate in this process, identifying areas of particular concern and suggestions for how they can be improved. At the meeting, SvR will be presenting their early observations and gathering your valuable input. If anything, we should be RAISING speed limits, not lowering them. Where do bikers and pedestrians get hurt and killed? In times and places where there is heavy congestion. That means arterials, NOT residential streets. Drivers try to change lanes and accelerate quickly or dart into gaps without looking when they have been waiting too long in a backup. Look at the police blog about where they run speed traps: West Seattle Bridge, Admiral Way, parts of 99, Airport Way, West Marginal Way… Every one of those places could comfortably have the speed limit raised a good 10 miles per hour, as well as ALL the interstates. Teach drivers that when you’re behind the wheel, driving is your first priority, and give them the tools to do so (reasonable speed limits and visibility at intersections) and congestion and safety will improve for everyone. I’d also love to see all those cops at the speed traps instead handing out tickets for driving 10 miles below the speed limit in the passing lane and not pulling forward when there’s a car behind you trying to get out of the crosswalk at a busy intersection. Please, please leave the safety improvements to transportation engineers and keep the politicians out of it! Speaking of loads of crap. Do you always blame the driver in front of you for following too close? I totally agree with you in the case of highways and highway-like roads, but this seems to be (mis)targeted at residential/side streets. Someone who already likes to bomb down residential streets at 40mph isn’t going to change their behavior if the speed limit is suddenly 20mph instead of 25mph. Plus, when was the last time you saw SPD speed trapping a residential street? They waste their time on roads like you mentioned with artificially low speed limits. At best, this won’t change or fix anything, and at worst will see the city lower already too-low speed limits on major thoroughfares. Why not just block them off and make people drive in the alleys? Then I guarantee no biker or pedestrian will be killed by a terrible car. I have a 2 car garage, rare on the hill. Block my street, I could use the extra space for my munchkins. Other than that this seems pretty stupid and a complete waste of time. When was the last time a biker/person was killed on a res street due to speed? Interesting when providing the fatality statistics they provide the statistic for a speed over the current speed limit (30 mph). Then provide the statistic at 20 mph (the proposed speed limit). The fatality rate provided at 30 mph assumes drivers are consistently speeding, and in the comparison static (20 mph) the assumption is that all drivers will be complying with the speed limit. It takes a law to “allow” the city to determine the speed limits on streets within city limits, enforced by city police, and maintained by the city DOT? Forget “states rights”, we need some city rights around here. I have to suspect that a lot of the negative reactions to this will come from the same conservatives that profess support of local control. Where by “local” they mean “minorities that agree with me”. Anyway, this is much ado about nothing. Drivers will drive at the speed they perceive to be safe, which on most roads as configured today is quite a bit faster than the speed that _is_ safe. Reason would suggest that traffic calming measures are more important than this paperwork. But I suppose in our reality SDOT will slowly implement change as budget allows, driven by driver noncompliance with posted limits, which were constrained by some twisted sense of sovereignty that makes this Olympia’s call. This should make drivers hate bike riders even more. And to the guy at the top I am with you I cant stand these jackasses that drive next to each other at 30 in a 40 and act like its their duty to block you. A 20 mph speed limit will instantly make those streets safe. Tell that to the cops that stake out the school zones daily, you’ll get laughed at, for the speeders arrive daily. It’s a false sense of security that this law will give, for no more enforcement will accompany it. If the objective includes for local jurisdictions to be able to implement speed limit changes without the red tape, then limit the law to that.